"From the Irish an Iar Mhí - Iar meaning west and Mí, the central place." Westmeath's northern regions are dotted with drumlins - small steep-sided hills that were formed by the melting glaciers of the Ice Age during the Drumlin Phase of the Ice Age (34,000 - 26,000 years ago), when glaciers deposited unsorted debris which was subsequently moulded into ovoid masses - drumlins - in the direction of the ice flow. The central and southern regions of Westmeath are flatter, with bogs and lakes. The southern part contains a long line of low hills, or eskers, yet another feature dating from the Ice Age, formed during a cold stage (80,000 - 65,000 years ago). Huge ice domes were forced to turn to the north and south by advancing Scottish ice. The inland ice was forced through the midlands, and with its retreat, it left till, moraines, sheets of sand and eskers behind. Main rivers/canals: Tang; Royal Canal; Deel; Black; Inny; Riffey; Yellow, Gaine. Main lakes: Lough Ree; Lough Iron; Lough Owel; Lough Ennell; Brittas Lough; Lough Bane; Lough Derravaragh; Lough Lene. Belvedere House and Gardens - on the shores of Lough Ennell. The house is considered one of the most distinguished houses in Ireland, set on the north-eastern shore of Lough Ennell with terraces dropping in three stages to the lake waters. It was built around 1970 for Robert Rochford, first earl of Belvedere whose accusation of an illicit liaison between his wife, Mary and his own younger brother, Arthur, provide the house with a fascinating historical backdrop. Add to this the tale of the Jealous Wall, Irelands largest man-made folly, built in the grounds of the estate as the ruin of the abbey. The wall was a result of a quarrel between the first Earl and his brother, George, owner of nearby Roquefort House (Tudenham House) to exclude from the first Earl's view the sight of his brother's residence of which he was jealous . Other follies include the Gothic Arch and Octagonal Gazebo. The grounds are noted for there ornamental gardens, stately trees and variety of shrubs. There is a walled garden and an arboretum surrounding the house. There are also lakeshore and woodland walks . Lough Ennell itself is studded with islands. "Cro-Inis" (Cormorant Island) was selected in ancient times by the Kings of Royal Meath as one of their abodes while Malachy, King of All Ireland, who succeeded Brian Boro, A.D. 1014, had a castle there and died on the island in 1022. The house is presently closed to the public with a major project underway to restore it to it's original grandeur and to cultivate additional gardens. Visitors can however enjoy the gardens and the fine vistas they offer of Lough Ennell, largest of the lakes surrounding Mullingar. A booklet on the estate is available upon entry to same and from local tourist information the estate itself, it's history the house and gardens as well as the Jealous Wall and other follies. LILLIPUT PARK & JONATHAN SWIFT HOUSE Also situated on the shores of Lough Ennell across the lake from Belvedere. Liliput Park was once owned by Boyd Rochfort, friend of Johnatan Swift, author of "Gulliver's Travels ". Swift was a regular visitor to Lilliput and it was while looking across from Belvedere at the people on the other side that he was reportedly inspired to write his famous work. To-day at Lilliput there is an amenity park including children's play area, 18 hole par 3 golf course, and a beautifully restored Georgian House accommodating a coffee shop in the summer months. Lilliput also holds one of Ireland's 3 inland Blue Flags for water Quality &amp; cleanliness and with safety equipment at hand is an ideal place for bathing. Locke's distillery museum is believed to be the oldest pot still distillery in the world . Guided tours explain why the famous Locke's whiskey was distilled. Craft shop and Coffee shop also open. AIB Better Ireland Award Winner 1997. Kilbeggan is also home to the only turf club approved race course in Westmeath and hosts evening meetings throughout the summer months. 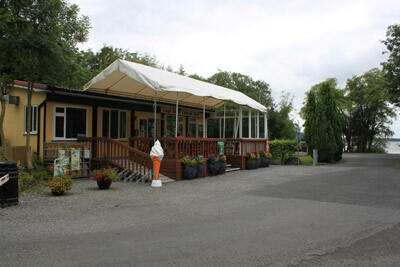 Tyrellspass Castle commands the arrival as you approach from Galway and enter the village which is situated on the main Galway / Dublin road, 8 miles from Mullingar. The castle has been restored to it's former glory and features a licensed restaurant, a coffee shop, antique shop and tower museum .The Castle's Medieval Banquets are a feature! Also of note in this pretty village, (a previous winner of a national tidy town's award )is the central green, a square surrounded by impressive houses built in the 1800s. This is the final stop on the tour so relax a bit in the Village Inn hotel, also sited in this square, before returning to your base - or maybe you'll like tyrellspass so much you'll decide to stay . Proprietors Gerry Cleary and Sandra Dunne will be delighted to welcome you to their cosy hotel .